I love Paris. Call me a romantic, but it's true. There are beautiful works of art, magnificent architecture in every unique building, awe-inspiring church buildings-turned-attractions for their aesthetic brilliance. Every winding street and alleyway exudes this rich sense of history, the scores of famous artists, writers, and intellectuals who have walked by the Seine or strolled beneath the Eiffel Tower. To sit in a cafe, sipping on espresso or wine, slowly enjoying a flaky croissant and the company of someone you love...there's nothing quite like it. If you've been there, you know what I'm talking about. Which is why I found myself delightfully enamored with Woody Allen's Midnight in Paris. 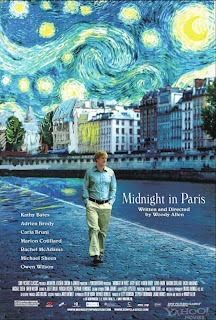 Sweetly romantic--in the best sense of that word--Midnight in Paris is intellectual whimsy at its best. The city of Paris is a central character itself, opening up its magical qualities for Hollywood hack writer Gil (Owen Wilson). Joining his fiance, Inez (Rachel McAdams), and her parents for a jaunt to Paris, Gil finds himself quietly less interested in Inez and falling more in love with the Parisian culture. He would love nothing more than to walk the streets--particularly if it's raining--and work on his novel in a shabby Parisian apartment. She wants to shop and see tourist attractions and live in the California suburbs. He's interested in writing and creating good art; she's interested in being successful and financially secure. You can tell where this relationship is headed. One night, Gil wanders Paris alone, finding himself lost in the maze of walkways and streets. He sits on the steps of a church; the clock strikes midnight, an antique car pulls up filled with partygoers, and the film takes an enchanting turn. The trailers don't give away the true magic of this film, so neither will I, suffice to say that the audiences who appreciate Midnight in Paris the most will be the ones who paid attention in their English classes and appreciate a more vivid culture than what you find on television and Michael Bay films. If you haven't been to Paris and don't like reading books, this film is probably not for you. It was a film for me, and perhaps is my favorite film of 2011 thus far. What I can share without spoilers is that Woody Allen has created his most nostalgic film to date. This is his 41st film--an incredible accomplishment--and it feels a bit like the memoir of an aging filmmaker reflecting upon his career. Owen Wilson perfectly embodies the traditional Woody Allen character as Gil--earnest, authentic, a bit neurotic while maintaing a sensitive idealism. Gil is writing a novel about a man who works in a nostalgia shop, holding onto to knickknacks from the past as treasures. Gil longs for the golden age of the 1920s in Paris, harboring a deep sense of "if only...." Allen uses the city of Paris as a muse for his nostalgia, a way to look back on the past and reflect on seemingly better days. In a moment of quiet revelation, Gil understands that one's present will always be someone else's past. We can live with a grass-is-greener mentality, romanticizing the glory days of bygone times or dreaming of always-better futures. Gil feels his writing and his romantic pursuits would have been better suited for past decades. Yet the present is what we have for this moment, and to embrace the present is a discipline worth pursuing. Even while watching the film, I was instantly drawn back to that week in Paris; my wife and I were celebrating our two-year anniversary, young(er), no children yet, my first time in Europe. It's easy to compare my life now--much more responsibility, a toddler demanding my attention, my first gray hairs appearing--to the past and wish it could have stayed that way. Yet I find a refreshing peace when I am present with my son, present with my wife, present with the people I am closest with, present to God, and present to my own soul. I write this on Memorial Day, a day where we're supposed to conjure up memories of the past, of wars and those who gave themselves in serving our country. And while I appreciate and love the past--it's where I came from, after all--I am learning to embrace the golden age of the present. 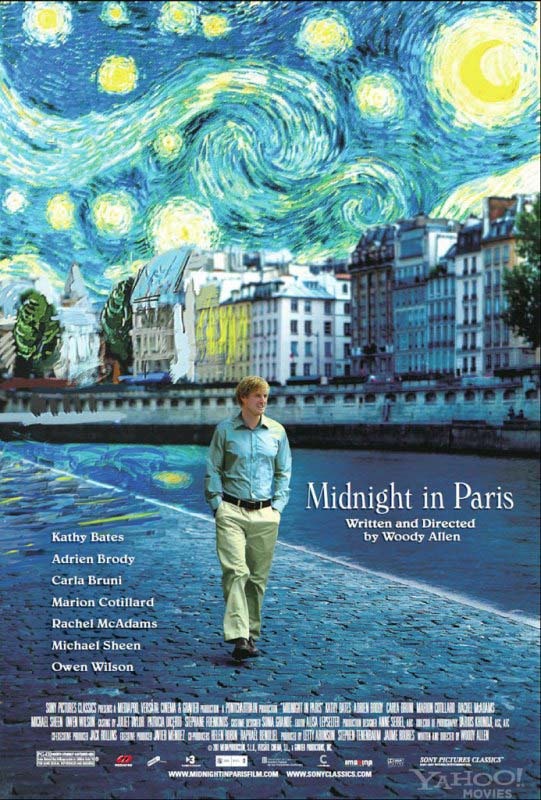 Midnight in Paris reminds me both of my best memories and the beautiful truth of the present. I love the premise of the movie! I am not a fan of either Owen Wilson or Rachel McAdams, but I love Marion Cotillard and Adrien Brody. There are so many authors I wish I could meet - Jane Austen, Charles Dickens and Agatha Christie especially.